Well, Fellow Geeky Readers – I’m coming towards the end of my Buffy the Vampire Slayer Retrospective. I only have two or three more posts, along with a round-up post, to end this extended look back at one of my favorite television series. It’s been a long journey and a wonderful flashback at a series that captivated my imagination, and influenced me in many ways while I faced off against those dreaded teenage years. The world is a better place thanks to Buffy and her friends and allies. What really makes the show so wonderful – besides the great set pieces, the storylines, and the dialogue – are the characters themselves. We all have favorite characters from the show, and we also have characters that we hate to love/love to hate. From Good to Evil, all of the characters that have appeared on the show have left their mark, and they will always be memorable for various reasons. I am a huge fan of anti-heroes and villains myself. I love the good guys and always cheer them on, but I also secretly root for the other team. One of the most dynamic, talked-about, and fun characters to be introduced into the series is the focus of this first post about my favorite Buffy the Vampire Slayer characters. Neither hero(ine) or villain, this character has certainly given Buffy and the Scooby Gang more than a few headaches, but in the end she was able to redeem herself on her own terms. Out of all of the characters that have appeared on the show, there is one character in particular that has captured my heart – fully and completely. A Slayer who is Buffy’s dark half, Faith Lehane is one of the best characters on the show, and her popularity has only continued to grow since her first appearance. 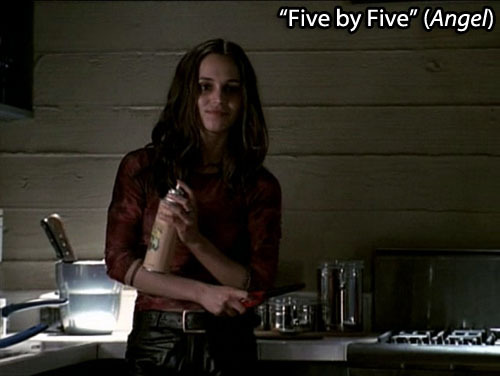 Portrayed by the beautiful and equally kickass Eliza Dushku, Faith’s approach to slaying and life in general was in counter to Buffy’s, and they butted heads on more than one occasion. A fatal mistake caused Faith to join the forces of darkness towards the end of Season Three, but she was able to gain some respect back at the end of the series in Season Seven. Eliza was able to take a character that could have easily shown up for a handful of episodes and turned her into a lasting presence with a large fanbase. She has certainly left her mark in the series, and her adventures continue on in comic series Angel & Faith. I highly recommend checking it out if you’re a fan of Angel and/or Faith, their friendship from Angel, or a Fangel (Faith/Angel) ‘shipper. It’s a very well-written and plotted series that teams up characters that I love as they continue their struggle with redemption and paying for the horrors of their past, while helping other lost souls in search of salvation. Why is she my favorite? What’s her story? I love my villains as much as I love my heroes, but there’s just something about a character that walks that fine line between the light and dark aspects of their psyche. Faith moves between both, but her journey for redemption has found her in the plus column for Team Good. Faith is a complex character with a past that continues to haunt her, yet she has shown a significant amount of growth throughout the years. She is definitely a different person now than the rebellious Slayer that we were first introduced to as she slayed a vampire in front of Buffy and the Scooby Gang in Season Three’s “Faith, Hope and Trick” episode. Faith’s ‘bad girl’ persona has always been a favorite of mine. She is snarky, sassy, and a wild child, but she can also be very dangerous. Her true colors really shone through in a pivotal episode in her storyline: “Bad Girls.” In this major Faith-centric episode, Buffy takes a break from being Lil’ Miss Good Slayer and decides to ditch school and hang out with her new “bestie,” much to Willow and Xander’s chagrin. Buffy discovers what it’s like to live a day in Faith’s shoes and it’s not half-bad. Unfortunately, things start to fall apart towards the end of the episode when our sister Slayers break into a sporting goods store and try to steal some weapons, escape from a police car, and the fateful moment when Faith mistakes a human civilian as a vampire. As soon as Faith drove the stake into Deputy Mayor Allan Finch’s heart, we fans looked on in horror as we realized what had just happened, and Buffy’s shocked expression perfectly mirrored ours’. At that moment things became real for our Slayers, and while Buffy tried to cope with the aftermath of Allan’s death, Faith started to slowly spiral downward. Watching Eliza act Faith’s indifference to Allan’s death and the consequences of her actions is a testament to her talents as an actress. Her scenes as Faith at the end of Season Three showed great maturity as well as character development, and man – did we feel her pain. Gone was the care-free wild child – in her place was a hardened individual who looked towards the Big Bad of the season, Mayor Richard Wilkins, as her new surrogate father. Faith also became a new, very human enemy for Buffy and the Scooby Gang to battle. One of the most insane fight scenes between both Slayers arrived at the end of the first part of the season finale – “Graduation Day, Part 1.” Earlier in the episode, Faith had shot Angel with an arrow, poisoned with a substance that was deadly to vampires. The only cure for this poison was the blood of a Slayer, and Buffy was determined to not only make Faith pay for her actions after she joined Team Evil, but even willing to let her die to cure Angel. Unfortunately, Buffy was unsuccessful but was able to take Faith out of the game for a while (a coma will do that to you), as she and the Scooby Gang – along with their high school classmates – battled and defeated the Mayor and his minions. Faith wakes up from her coma eight months after the Mayor’s defeat at the hands of Buffy. Looking for blood and revenge, Faith uses a device to switch bodies with Buffy. Faith sees how starkly different Buffy’s life is from her own, and she starts to slowly unravel (again). She hates who she has become, and Buffy is startled by the revelation as she sees Faith (in her own body again) disappear, location unknown. Faith makes it to Angel’s new home, Los Angeles, and causes hell and havoc as soon as she enters the city. She tries to kill Angel and hurts his fellow partners in Angel investigations: Cordelia Chase (punches her in the face) and Wesley Wyndham-Pryce (tortures him). But something inside of her finally breaks. Faith has finally hit rock-bottom and Angel is there to help her pick up the pieces, reminded of his own failings as a human and the devastation that he caused when he was his soulless alter-ego Angelus. After a heated confrontation with Buffy (having arrived in the City of Angels after hearing her archnemesis tried to kill Angel), Faith turns herself in to the police. She has a moment of serenity and calm as we see the camera focus on her face as she sits in a prison cell, finally finding some peace in her life. Of course, this won’t last long. Our dark Slayer is called upon to help Angel Investigations capture the newly-desouled Angelus. Angel visited Faith in prison several times, and she felt that she owed it to him to help him before his son, Connor, and the demonically possessed Cordelia killed him. Faith is able to capture Angelus after injecting herself with a mystical drug called Orpheus, which causes vampires to trip out as they drink from their human hosts. Angel’s soul is restored before Connor stakes him, and Faith makes her way back to Sunnydale to assist Buffy in her upcoming battle with Evil Itself, the First (Evil). Faith is not exactly welcomed home with open arms (can we blame them? ), but with reluctant acceptance of the help that she can offer Buffy and the Scooby Gang. The Scooby Gang has significantly grown with the newest additions to Team Good: the potential Slayers that have been arriving in Sunnydale, escaping from the Bringers sent by the First to kill off the Slayer line. Faith is finally (almost) fully redeemed in Buffy’s eyes during their fight in the Hellmouth against the First’s army, as Buffy hands over a powerful Slayer weapon to Faith – a sort of passing of the baton, of the deadly variety. In that moment, Faith is finally trusted by Buffy, and she does not let her down. My favorite Scooby Gang scene is the final shot in Season Seven’s “Chosen,” where our heroes gaze over at the crater that was Sunnydale before it imploded. In that last shot Faith stands with the remaining Scooby Gang members, having fought the good fight and surviving to live another day. Kudos to Joss Whedon for including Faith as an integral character to the final five episodes of the series.